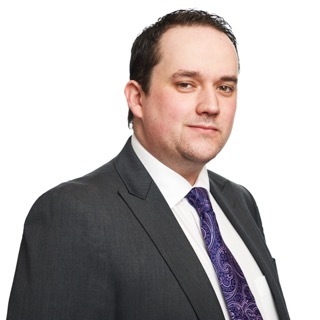 We look back on his career so far as the Scot is made an honorary freeman of Argyll and Bute. 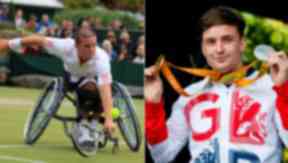 Gordon Reid has enjoyed a sensational 2016, ending the year with four Grand Slam titles, a Paralympic gold and as the number one wheelchair tennis player in the world. To top it all off, the 25-year-old is being made a freeman of his home town. His extraordinary achievements come 11 years after he first took up the sport in Helensburgh. As he is made an honorary freeman of Argyll and Bute, we look back at how his career has developed since his early days on the tennis courts. Gordon was born on October 2, 1991, and grew up in a busy sporting household. As well as sharing an enthusiasm for tennis with his two brothers and sister, like a lot of Scottish schoolboys he was keen on football. The four Reid children took up junior tennis at Helensburgh Lawn Tennis Club but days before Gordon's 13th birthday in 2005 he developed a rare neurological condition. The symptoms of transverse myelitis can vary greatly but essentially it roots to the spinal cord, with one of the main indicators being muscle weakness in the legs and a general change in feeling to the body below the bowel and bladder. Weak leg muscles with the condition can lead to complete loss of movement in the legs quickly, as was the case with Gordon. Through rehab and regular exercises he managed to regain some feeling to the point that these days he can stand and walk very short distances. The necessity for a wheelchair was still there, however, and a year after the original diagnosis Gordon was on a visit to Scotstoun Leisure Centre when discovered an avenue to remain in tennis. He took to it quickly, with some early difficulty of multi-tasking between what he loved to do in playing tennis with what he had to do in manoeuvring the wheelchair around the court. The early promise was evident to coaches and peers as he broke into the men's singles top 100 after British Open and Junior Masters wins. He was subsequently nominated for the 2006 BBC Young Sports Personality of the Year, an award eventually picked up by England and Arsenal striker Theo Walcott. A National Championship followed in 2007 before joining Great Britain's juniors at the World Team Cup. 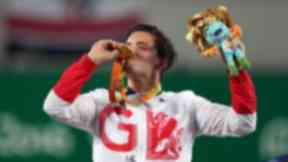 He was chosen to go to Beijing with Team GB for the Paralympics in 2008 aged just 16. Later that year he made his men's wheelchair doubles debut at Wimbledon. More victories in the Junior Masters series continued to secure his place among the rankings with success in men's and boys' events as well as single and doubles. By early 2009, he was number one in the boys' ranking and up to 16th place in the men's singles. In 2010, he won three singles titles, beating the world's top three ranked players, and four doubles titles. 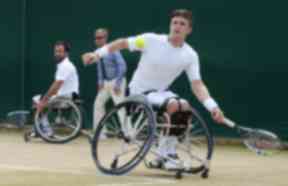 Reid then reached the semi-finals of the men's singles and the doubles at the London Paralympics in 2012. He knew - eventually - he would win the gold. By 2014, Reid was regularly reaching the latter stages of the four wheelchair tennis Grand Slams. That year and the following he was named the Tennis Scotland International Player of the Year (a joint award with Andy Murray in 2015). He and partner Michael Jeremiasz lost out on the Wimbledon wheelchair men's doubles final, his fifth at the Championships, before partnering with Japanese Shingo Kunieda to take home the first Grand Slam of his career winning the French Open at Roland Garros. September brought around the US Open with new partner Stephane Houdet and the pair went on an unbeaten run of 19 matches which included the final of Reid's second Grand Slam success (this time playing against his former partner Jeremiasz). At the start of this year, the doubles success rubbed off onto his singles game as he eventually claimed his first solo title at the Australian Open. In an interview with STV News he said his road to victory Down Under had been "incredible" and added it was "definitely not the end of it yet". His statement rang true as he returned to Wimbledon in 2016 with an aim to make big statements at the doubles and newly formed men's singles competition. 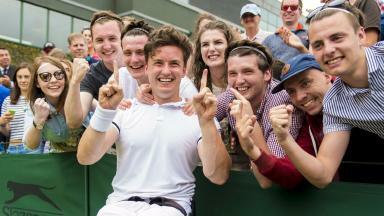 Reid and new partner Alfie Hewett took the men's wheelchair doubles title on the second Saturday while the Sunday was shaping up to be a big day as Reid made the singles final while Andy Murray, Heather Watson and Jordanne Whiley also in trophy contention. He managed to beat Sweden's Stefan Olsson 6-1 6-4 to the delight of a large crowd on Court 17, taking home a cheque for £25,000 in the process. 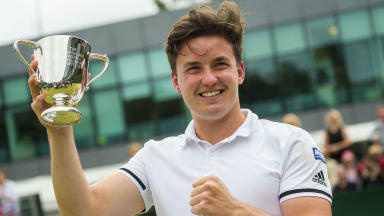 Reid's partnership with Hewett was solidified at the All England Club but it transitioned on into the Paralympics, which was the Scotsman's third attempt at placing among the medallists. He and Hewett found themselves in the final, again against a former partner of Reid's in Houdet, however they lost out on the gold 6-2, 4-6, 6-1. It may have been Reid's first Paralympic medal but it would not be his last. Not even that week. The prediction of 2013 that he would win a gold medal eventually came to fruition when he faced his current doubles partner Hewett in the final. A straight sets 6-2, 6-1 victory was all it took for Reid to claim the gold in what was another eventful day for Team GB. Despite fitting in a bigger schedule with Grand Slams and Paralympic Games success, he still managed to find time to convey his bright persona, one of a man enjoying where he was in life. 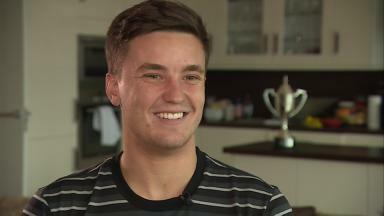 In this video he even took on his namesake, Glasgow Warriors rugby star Gordon Reid, in a light-hearted sporting contest. By the start of this year Reid was fourth in the singles rankings but the Grand Slam singles titles at the Australian Open and Wimbledon and doubles titles at the French Open and Wimbledon put him on the edge of another achievement to cap off a startling year. After much being said about Andy Murray becoming the men's world number one and brother Jamie becoming the doubles world number one, the Wheelchair Masters in December provided Reid a chance to make his own history. Once again it came down to a match with Houdet, in the second last match to ensure his place at number one, a place which wouldn't be lost irrespective of the outcome of final game. The Scot put in a dominant performance to win 6-2 6-1 and add to the Murray achievements which have firmly cemented Scotland on the tennis map. Although he lost out the final to Joachim Gerard the 25-year-old was happy to reflect on the past 12 months when he arrived back in Glasgow. He told STV: "I just want to keep enjoying playing tennis, enjoying the travelling and try to improve. "I have to make my game as good as it can be, and continue the hard work behind the scenes that got me here in the first place." Days after the ranking was secured he was to travel to his hometown and made an honorary freeman of Argyll and Bute. But his success should ensure that he would be welcome with open arms wherever he would arrive in Scotland. 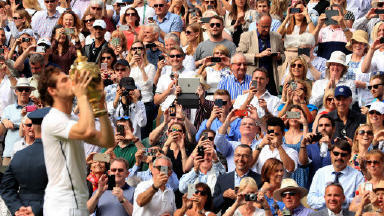 11 Jul 2016 Does double Wimbledon joy make Murray this country's best ever sportsman?